A meeting between Hamas politburo chief Khaled Mashaal and Fatah official Azzam al-Ahmed to jump-start unity yielded no fruit. A meeting in Cairo between Hamas politburo chief Khaled Mashaal and Fatah official Azzam al-Ahmed on Wednesday made no headway towards a unity government. An aide to Azzam speaking on condition of anonymity told reporters after the two-hour meeting with Mashaal that the meeting produced "nothing new." Mashaal and his deputy Moussa Abu Marzouk discussed with al-Ahmed "the possibility of advancing the reconciliation process, in particular a government of national unity, but the meeting produced nothing new," the aide said. Fatah "stressed the importance of allowing the electoral commission to resume operations within the (Hamas-run) Gaza Strip so that President Abbas can set in motion the procedures to form a government, and fix a date for the elections," an Egyptian mediator said. Hamas said it was possible "to resolve the question of the electoral commission through consultations with [Abbas] over the formation of the government he will head under the terms of the Doha declaration," he added. Mashaal and Palestinian Authority Chairman and Fatah leader Mahmoud Abbas met in Doha on February 6 and hammered out an agreement for the formation of an interim government of independent technocrats. Under the terms of deal, Abbas was to serve as head of the interim PA government, ending a bitter dispute between the two sides over who would serve as Prime Minister. However, a growing rift between Hamas' political leadership outside of Gaza and officials in the Hamas-ruled enclave over the terror group's direction resulted in sharp criticism for the agreement. 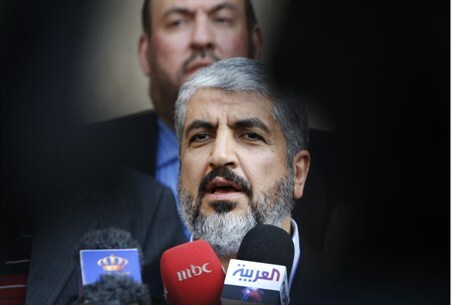 At an internal meeting chaired by Mashaal in Cairo on February 23, Hamas officials presented him with new terms for a unity government with Fatah. However, Hamas’ Gaza chief Ismail Haniyeh maintains that all talks with Israel are “futile” and believes the tide of the Arab Spring will lead to victory in the movement’s armed quest to destroy the Jewish State. An official familiar with the terms told the Bethlehem-based Maan News Agency that Abbas would almost certainly reject the new terms. "Hamas demanded to keep the key ministries in the new government, including the Ministry of Interior," said the official. "It also demanded no change in the structure of security services in the Gaza Strip." The Interior Ministry controls the Hamas 'security services.' Additionally, the source said Hamas "was not prepared to abandon control of Gaza." In essence, the new terms would allow Hamas to retain sole control over Gaza while giving it a say in the running of PA enclaves in Judea and Samaria. The deal has faced internal opposition from some senior Fatah leaders as well, who charge PA law forbids Abbas from serving as President and Prime Minister at one time. Feuding Hamas and Fatah have been struggling for a year to implement the terms of a reconciliation deal signed in Cairo in May 2011, which called for the formation of an interim unity government to pave the way for presidential and legislative elections. Representatives from the two sides met several times to determine the composition of the interim government, but could agree on who should head it. Hamas and Fatah's long-term rivalry turned bloody in 2007 when Hamas seized control of Gaza in a violent putsch.